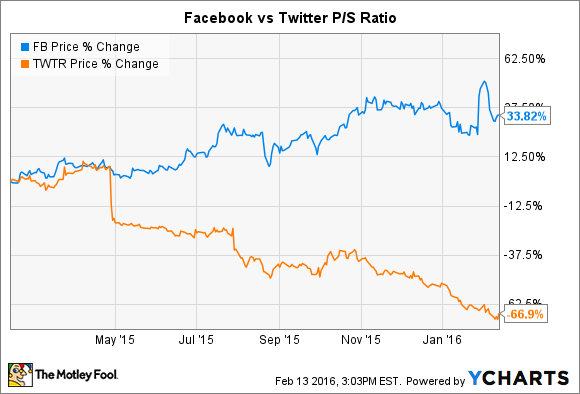 Facebook's revenue growth rate will surpass Twitter's this year. Twitter's (NYSE:TWTR) user growth, or lack thereof, has gotten all the headlines since the company released its fourth-quarter earnings, but management's first-quarter outlook has only received a few lines in earnings recaps. This quarter, Twitter expects to generate between $595 million and $610 million. Wall Street analysts were expecting around $628 million for the first quarter; they've since revised their estimates down to a $608 million consensus. For the full year, analysts expect revenue growth to come in at just 34%. Comparatively, analysts expect Facebook (NASDAQ:FB) to grow revenue at a faster rate despite a significantly higher base. Wall Street sees Facebook bringing in over $25 billion this year, more than eight times as much as Twitter. What's more, that revenue is far more profitable than Twitter's. Facebook reported an operating margin of 44% last quarter, whereas Twitter's operating margin came in at negative-9%. It's easy to see that one deserves a premium valuation while the other deserves to be valued below its peers. While Facebook's price-to-sales ratio has remained relatively steady over the past year, Twitter has seen its ratio decline 77%. Today, Facebook trades for about 16 times last year's sales, while Twitter stock costs just 4.7 times sales after its latest report. Just a year ago, Twitter was a high-flying revenue-generating machine. Even as user growth slowed, Twitter continued to increase the amount of revenue it generated per user. During the fourth quarter of 2014, Twitter grew revenue 97%. That growth rate was cut in half last quarter to just 48% as user growth stalled entirely. The midpoint of Twitter's outlook, points to year-over-year revenue growth of just 38% this quarter. The company has lost all momentum. In light of their revenue growth rates, it makes sense that Facebook would trade for a similar (if not higher) PS ratio today than it did yesterday, while Twitter's has correspondingly fallen. There are two key metrics for both Facebook and Twitter's revenue growth: user growth and average revenue per user. User growth is important not just because more users mean more advertising opportunities. A larger user base is also more attractive to brand advertisers. Instagram's user base surpassed Twitter's at the end of 2014, and then the photo-sharing app continued to add more users in 2015 while Twitter's user growth stalled. Meanwhile, Snapchat is rapidly growing its user base, with the most recent estimates putting its monthly active users at 200 million, while Snapchat officially reports 100 million daily users. A smaller user base means Twitter sales reps have to work that much harder to attract the budgets of brand advertisers. As a result, operating margin declines, making each dollar of revenue worth less than competitors'. If Twitter isn't increasing its user base, it needs to show outsized growth in average revenue per user. Twitter's average ad revenue per user in the United States is less than half of Facebook's ARPU for the U.S. and Canada. Globally, its ratio is a bit better, but still only 55% of Facebook. More importantly, however, is that Facebook is increasing the gaps between its ARPU and Twitter. In other words, if both companies experienced flat user growth, Facebook would still generate better revenue growth than Twitter despite its larger base. Both companies have other properties that are either pre-revenue or in the very early stages of monetization. With significantly larger user bases for its properties, Facebook is in a much better position for sustained revenue growth in the very long term. These reasons are why Twitter has lost a lot of value over the past year and Facebook trades for the same value it did a year ago.